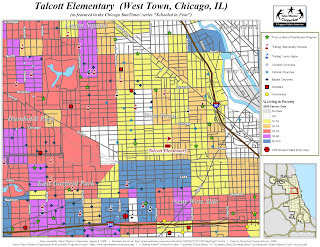 Supplementary Maps for the Sun-Times feature "Schooled In Fear"
They "surveyed at least one classroom per grade in first- through eighth grade at each of three schools: Sexton Elementary in Woodlawn; Little Village Academy on the Near Southwest Side, and Talcott Elementary in West Town. A total of 482 students responded." The researchers reported the results of the survey in a series of special reports, titled "Schooled In Fear" last week in the Sun-Times. If you click on that link and read the article, you'll see a simple little map which shows the physical location of each of the schools. We at Tutor/Mentor Connection are big "map fans" as you know, but we wish that maps used by the media could show more detail about the area surrounding the locations on which they focus. So we occasionally create "supplements." In these supplemental maps, we try to show resources in the community - people and organizations that can help organize and support new and existing tutoring and/or mentoring programs. The goal is helping prepare kids to achieve in school and in life, and hopefully work to alleviate the poverty which is directly related to the violence. And hopefully such tutoring and mentoring programs can offer a glimmer of hope to the fourth grader who lamented in the Sun-Times report that, "I would feel good if I lived in a different city. I would not have to be scared to go outside.'' How can T/M programs help? In an associated article, "They Are Being Robbed of their Childhood," Marissa Juarez, 11, says it better than I can, "Kids would be interested in after-school programs and it would keep their minds off gangs. It would keep them inside and safe." 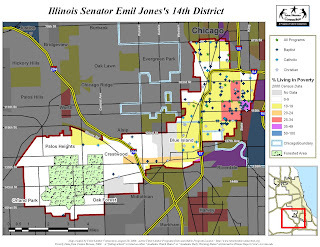 So lets look at the maps, and explore how the existing resources in the neighborhood can be used to help Marissa and her peers through after-school tutor/mentor programs such as Cabrini Connections. Dan Bassill did a thorough analysis in his blog entry this week, and I will borrow liberally from his observations. He observes that the neighborhood surrounding Little Village Academy has "3 hospitals and several churches in the area, as well as the two expressways (I-290 and I-55) which go through the neighborhood on the North and the South. Thus, thousands of potential volunteers pass through this area every day." I would add only that all those churches can provide perfect locations for after school activities if they are not doing so already. 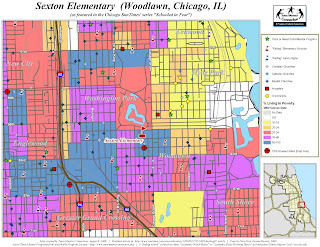 In regards to Sexton Elementary, mapped above, Dan looks at our map and notices that there are "very few tutor/mentor programs near the school, yet the school is very close to Hyde Park and the University of Chicago and University of Chicago Hospital." As we discussed in an earlier blog, universities and hospitals by their very nature (and often written into their mission statements), have an inherant interest in the welfare of the community, and "if teams of students, faculty and alumni from the university begin to use their time, talent and dollars in a long-term strategy aimed at pulling youth through school and into the university, this neighborhood might be filled with the best tutor/mentor programs in the country, not just one of the best universities and hospitals." The final school featured in the Sun-Times survey, Talcott, is located on the near West side. Dan points out that this area also "has three major hospitals and major highway access routes that volunteers from the city or suburbs could take to be part of tutor/mentor programs in the area." And again, there are just far too few green stars here. There simply needs to be more T/M programs for all the kids in the area. How can we get more programs? Dan explains that "what's needed is leadership from businesses, universities, media to encourage volunteers and donors to support existing programs, or to form learning and planning teams to help develop and sustain new programs in underserved areas." But what if you aren't a business, university, or media leader? Fortunately, Tutor/Mentor programs offer rewarding experiences for volunteers as well. Chances are there is a program near you that can afford you a chance to work with a kid like Marissa for a few hours each month. And lucky for you, Tutor/Mentor Connection makes it easy to find just such a program. Just use the Program Locator's search engine, or simply click on a specific zip code using the zip code map. I'm in the middle of an ongoing discussion with Jim Cory and some of the other map makers on the Tutor/Mentor Connection GIS team about a sort of conundrum that affects us as map-makers, educators, and Tutor/Mentor program advocates. We need your help. 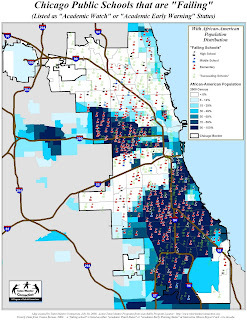 I think the resulting map clearly shows that clusters of "failing" schools are more likely found in impoverished areas, than in communities where poverty is low. Likewise, there are an awful lot of "succeeding" schools where poverty is low. (I should take a second here to point out that I am certainly no authority on the math behind "failing schools." In fact, I've asked several people - including teaching and administrators - how this works, and how schools are chosen for these warning lists... and no one seems to know for certain. So again, I'm no guru here by any measure. I only know what I've been told by some folks who work in the schools, and by what I've learned from the IIRC website. If anyone knows FOR CERTAIN how schools are determined to be "failing," I would love any feedback. This would help me make better maps for sure. But then I had a brainstorm and decided to play a little bit here, using some of the other data I have. For these "succeeding" schools, I looked at their "% of Students Exceeding Expectations" data (which is apparently one of those variables used to determine "failing" schools). Learning that schools need to be above 40% for this particular variable, it makes sense to assume that schools that are currently not "failing" but are below 40% "Students Exceeding Expectations" are surely on the path to warning lists and state sanctions. In other words, instead of saying "look at all these succeeding schools," I think the map now shows that the "succeeding" ones in the impoverished neighborhoods... the ones not meeting expectations... maybe they just haven't been tagged "failing" yet, and maybe they're on course to get that tag soon. So I'm already playing with assumptions, but here's where it gets real hairy... Dan came to me next and asked to see the "failing" school data against a backdrop of neighborhoods' racial makeup. Looking at the resulting map, it's pretty hard to miss all that segregation... "hypersegregation" in fact... isn't it? Surely, everyone knows this all to be true, right? Not so fast, warned Jim. "When I look at the race distribution maps," he noted, "I think that we need to be careful about the message we convey. Are schools poor because the majority of students are minorities?" I hadn't thought from that angle. But damn it, I bet that is the conclusion people will draw, isn't it? Any rate, Jim sent me something else to consider, an empirical study on "High Poverty-High Performance (HP-HP) Schools" by the research division of the Illinois State Board of Education back in 2001. Therein, researchers compared "High Poverty-High Performance" (HP-HP) schools to "High Poverty-Low Performance" (HP-LP) schools (the latter of which surely apply to many of the "failing schools" where African Americans and Hispanics are concentrated). The report searches for answers as to why some schools in these areas are actually "succeeding" (HP-HP). But the report also cites qualitative factors such as "time and energy spent by teachers," "teacher outreach to parents," and "student sense of responsibility." How do you measure student and teacher motivation? I can't map that! Can I? As Jim asks, "What other kinds of influences affect success? Can we map them? I think if we look deeper at the problem we will find complexity, but also compelling reasons for people to mentor." And this is precisely the question we're stuck on here at Tutor/Mentor Connections.